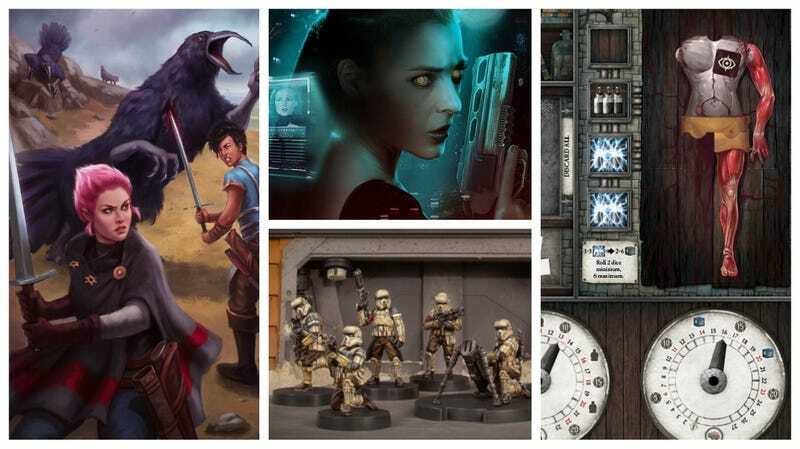 Welcome back to Gaming Shelf, io9's regular column all about the fantastic world of board games and tabletop roleplaying games—focusing on sci-fi and fantasy, of course. This time around we’ve got some exciting announcements in the worlds of Altered Carbon and Magic: The Gathering, as well as a Kickstarter for a story expansion to the board game edition of the classic video game The 7th Guest. Yes, you heard that right. Against his wishes, Victor Frankenstein’s work isn’t over yet. Plaid Hat Games has announced Abomination, a new strategic worker placement game set 20 years after the events of Mary Shelley’s Frankenstein. Players work as scientists to construct a new companion for Frankenstein’s Monster...before he’s killed by a man who promised Frankenstein he’d put an end to his creation. Players can use any trick in their arsenal to complete their task: lie, bribe, exhume, even kill. Anything is possible when you’re creating life. Abomination is currently available for preorder at $60, and should be out this summer. The movie might be tanking at the box office, but Hellboy is still one cool customer. Mantic Games is now taking pre-orders for Hellboy: The Board Game, which comes out on April 19. In the game, players become members of the Bureau for Paranormal Research and Defense, investigating occult threats and fighting scary bosses. The normal game is about $98, but there’s also a collector’s edition for almost $200 that includes all the Kickstarter bonuses...as well as a ticket to watch the new Hellboy movie at a private screening at the Savoy Cinema in Nottingham. But given how the movie’s doing, that might not be the most tempting offer. Creator Ryan Laukat has announced his latest fantasy adventure. Taking place in the land of Arzium (the same location as games like Above and Below, Near and Far, Islebound, and City of Iron), Roam players take on the role of adventurers who are seeking to find and revive other adventurers...who’ve all fallen prey to a sleeping sickness that caused them to wander out into the wilderness and pass out. And the more people you gather to your side, the easier it is to find and help others. Roam will be on Kickstarter through April 23, and the minimum pledge for a copy is $22. The game is expected to ship in October or November, depending on the pledge tier.